Who says Amazon is trying to kill the local library? The company’s latest venture brings the power of the Kindle to public and educational libraries through a partnership with OverDrive. That sounds like love, not hate. Exact usage details weren’t released, but patrons will be able to check out ebooks from their local libraries on all Kindle models and platform apps. The Whispersync technology will then preserve digital notes and bookmarks in case the book is checked out again or purchased through Amazon . OverDrive, being a digital infrastructure company, will likely provide the necessary services for libraries. Lending digital books is not a new concept and is something that, thanks to the silly concept of a limited number of digital copies, isn’t currently widespread. 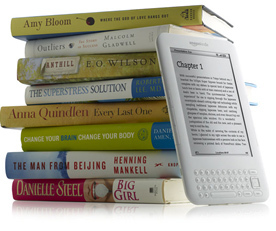 Hopefully the Amazon/OverDrive model solves some of the issues currently associated with ebook lending. The venture was just announced so chances are you know more than your local library. The presser does mention that Kindle Library Lending will come later this year so stay tuned for all the details.